The items below are usually kept in stock and can be ordered throughout the year, depending on our inventory. Click here to order online. All of our chickens forage and free range without cages, pens or chicken tractors. 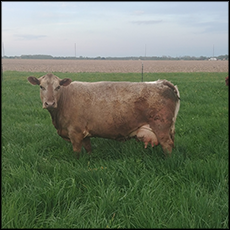 Their forage is supplemented with only locally grown Certified Organic Feed. We raise chickens that can walk, forage, and are lively, healthy birds which make highly nutritious and healthy chicken — unlike hybrid birds most farms raise that can hardly walk. Keep in mind that store bought chicken is regularly injected with saline — up to 15% of the weight you pay for in the store is added water. There is one frozen chicken per shrink wrapped package. You can get them whole or cut into eight pieces. 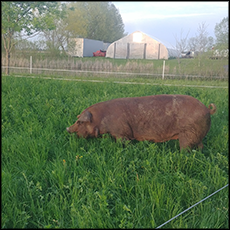 Our Eggs are from heritage breed hens that forage and free range on green pastures and are allowed to forage outdoors all day (with the cattle and pigs) without cages or pens or any confinement. 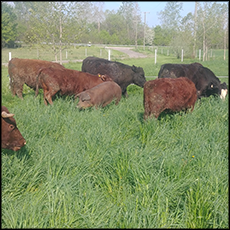 Their forage is supplemented with only locally grown Certified Organic Feed. All cuts of meat are vacuum sealed in clear freezer wrap and frozen.